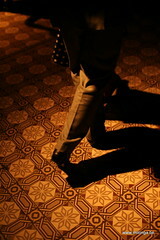 I have been taking tango pictures intensively for more than 2 years now. Most of that time I’ve been using a Canon 350D with a number of lenses. 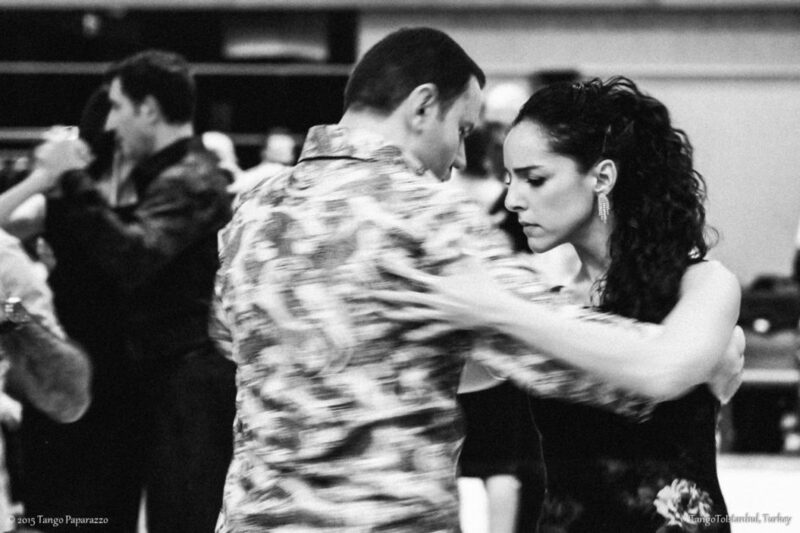 What’s special about tango pictures? Most importantly, the tango events are in the evening/night with minimal lighting. I avoid using a flash, since it’s unpleasant for the dancers and because the pictures have very sharp and ugly lighting. Another thing is that I don’t use a tripod. I can’t tell the dancers where to move or to stand still, so I go with the flow. The fact that they move also means I need a shutter speed of 1/15s at the slowest; 1/20s is better and 1/40s is comfortable. All these tips come down to the same: get the fastest shutter times possible while keeping the picture quality acceptable. If you can use sensitivity ISO 800 instead of ISO 100, you’ll win 3 stops. This is the difference between a picture at 1/40 sec (sharp) and 1/5 sec (blurry), certainly with moving targets (and tango dancers do move). Of course there is a trade-off: you loose colour detail. This is the main reason why you’ll need a camera with a decent sensor, or in other words, an dSLR instead of a regular point-and-shoot camera. Even my 350D gets colour defects at ISO800. When they’re too bad, I tend to convert the pictures to black-and-white or somewhere halfway (by decreasing the saturation). The camera I’m drooling over now, the Canon 5D Mk II, can take decent pictures at ISO 3200. That’s another 2 stops faster. You need a lens that will let in a lot of light, that allows you to use maximum aperture. Your standard kit lens that goes from f/5 to f/3.5 probably won’t do. You will need a better lens and it will probably cost some money. I started with a Canon fixed 50mm f/1.8. Contrary to what I said before, this is a cheap lens (about €100). It’s a great portrait lens, but it is hard to get a tango couple from head to toe in a picture, you’d have to step back too far (50mm on a dSLR is slighty ‘tele’). It’s great for abrazo (embrace) pictures of the upper bodies. For the last Brussels Tango festival, I bought a Sigma fixed 30mm f/1.4. It’s pricier, heavier but it fits the purpose better. The f/1.4 lets in more light (it’s a 1/3 stop ‘faster’ than a f/1.8) and the 30mm lens (which, on a digital SLR that does not have a full-size sensor, is equivalent to a 45mm lens) allows me to fit people full-length into the frame. The drawback: with wide aperture, the depth-of-field becomes very narrow. This means: you focus on something e.g. 1.55m away, and every thing closer than 1.40m or further than 1.70m is already blurry. While this is also a feature (it’s a great effect for portraits up close), this means that if your autofocus is just slightly off, everything will be blurry. The error margin is very narrow. Obviously you’re not going to use the standard ‘portrait’ or ‘landscape’ mode. You should go for either aperture priority “Av” or shutter priority “Tv” mode. The first one allows you to always use maximum aperture and get the best shutter speed that you can. The second one would make sure that you use reasonable shutter times for moving subjects (like 1/20 or 1/40 sec). I prefer using “Av” and fixing the aperture on f/1.4. I take risks with that, because sometimes I end up with pictures with shutter times of 1/10 or 1/5 sec, but with some luck and good timing, they come out OK. It’s just my default “gimme all you got” setting. I don’t use “M” Manual Mode because I don’t have the time before each picture to decide how much aperture/shutter I want. Put your autofocus on 1 point, I use the middle of the frame. This is important because you want to control on what part of your frame your camera tries to focus. You have to force yourself to the following sequence: focus, reframe, shoot. The point on which you focus will be one with the most contrast. It might be an upperarm, where the skin and clothing touch, or the face, or some pattern with contrasting colours on the back. People who are fully dressed in plain black (and there are a lot of those in tango) are very hard to auto-focus on. The framing you use to focus and the actual frame you want to shoot will seldom be the same. So you need to reframe right after focusing. You focus by pushing the shutter button halfway and then you keep it pushed like that while you reframe. When the composition is right, you click all the way and the actual picture is taken. This is the main reason why people unfamiliar with my camera have a hard time taking acceptable pictures with it. They point at a dancing couple, they push the button all the way immediately, the camera focuses on something in between the two dancers -typically a far away wall- and the shot is unsharp. If the 4 tips above still don’t make your shutter times acceptable, try using exposure compensation (the AV+/- button). I sometimes use a full stop of underexposure and I correct it in ‘post’. I use the contrast maximisation in Picasa to stretch the histogram again. Also, in tango venues, there are a lot of spot lights (to make it cosy). If I focus on a dark part and then reframe to something that includes some of those lights, they might end up clipping part of the picture. When I underexpose, this becomes less of a problem. The drawback of this method is very similar to using high ISO values: it messes up your colours. So in a lot of cases, you might have to make the picture black and white. But if the moment, the composition was valuable, and the shutter speed was just good enough, you can still end up with a really nice picture. So how much does this all add up to? If you were to take pictures with a compact camera: f/2.8 lens, ISO 100 and shutter time of 1/30 sec, you need a lighting situation of EV 8 (40%). In my situation, a f/1.4 lens, ISO 800 and the same 1/30s shutter allow me to take pictures in a EV 3 (20%) situation a.k.a. “very dark”. I just won 5 stops. With underexposure, I can go lower still, to EV 2. It makes a lot of difference. Thanks! Good tips for shooting indoor all together I think. Underexposing is maybe not such a good idea in my opinion, it just adds to the noise. I’ve been testing my 50D in low light environments for a couple of days now and it’s great! I can easily go to 1200 ISO without noise (the 350 and 400 already start showing significant noise at 800), and it’s not as expensive as buying the 5D and it also has the DIGIC IV processor. What I miss in this post is the use of spot metering. I use this often to meter for the subject that is lit and not do an average metering of the whole photo which leads to overexposed subjects and too long exposure. I’ve great results with a Canon 5D, ISO 32000, speed 1/60 and F 1.4 50mm lens. A full frame sensor helps a lot avoiding noise. I always shoot manual in low light situations because the light doesn’t differ very much so you won’t end up with overexposed pics. And if some are a little overexposed you can always recover the details in Lightroom if you shoot in RAW mode of course. Using RAW mode will open a new world, give it a try! And if you’re planning buying a new cam but have a low budget than the Canon 5D is a good buy as it decreased in price since the Mark II has been announced. I’ve had a lot of fun with Tango (been a dancer for 8 years) and I’ve recently started to take more photos of tango. Low light, high speed is the game and after 25+ years of photography I have to say that the new Nikon D3 IS the “tango camera” of choice. 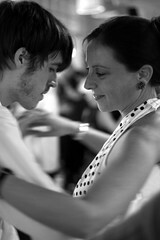 To capture the intimacy of tango often the subject should not be aware that you are photographing them. I have found the AFS Nikkor 300 mm f/2.8 VR lens mounted on a monopod (or hand held) to be great for capturing that closeness one feels while tango dancing. My next favorite would be the Nikon 85mm f/1.4D AF Nikkor Lens shot wide open. You can see what I mean by looking at my site, http://www.photobywesley.com. I have nothing against Canon but it looks like in this last go around Nikon has Canon beat in the “low light, high speed” game (speaking of the ISO 25,000).